Decent performance, high capacity, high potential. 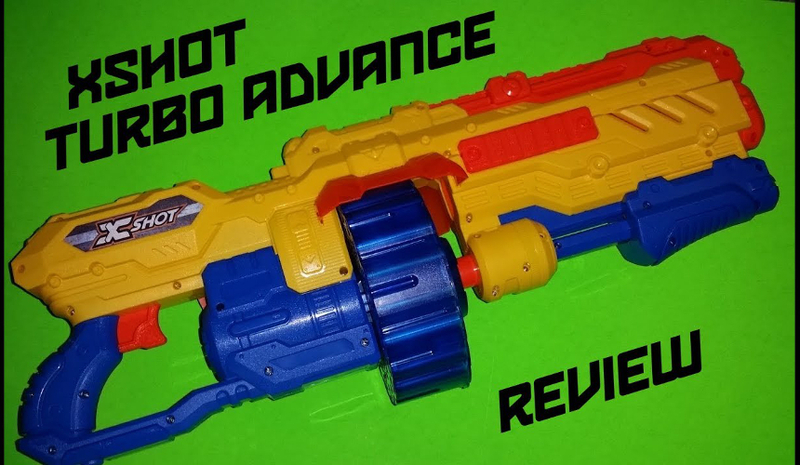 I’ve had the Turbo Advance on hand for nearly four months, and did a quick video review which consisted essentially of a slide show of internals and my thoughts on the blaster. 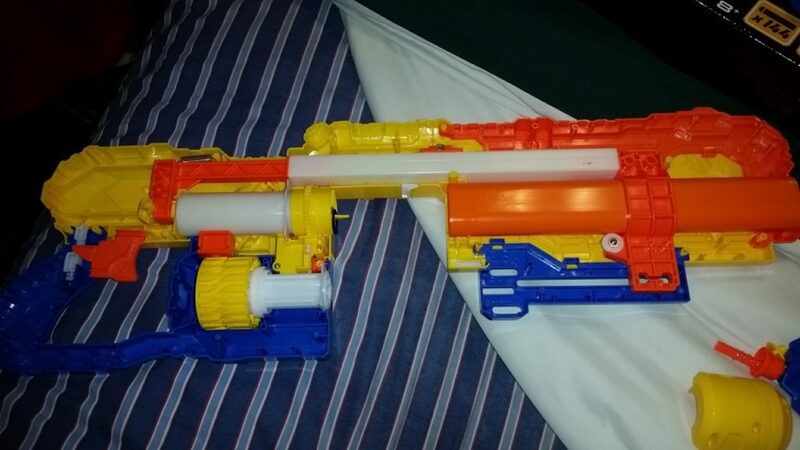 I’ve waited to do a proper write-up until now because I wanted to see what I could do with the blaster, both in terms of modification and war/HvZ use. It’s a good blaster, but with some love it can be even better. The Turbo Advance is a forty shot, cylinder-fed blaster. I found mine for $25 at Sam’s Club, complete with 144 Xshot darts. Other packages, with 96 darts, have also been seen for various prices. The cylinder splits the forty darts into two circles of twenty each. 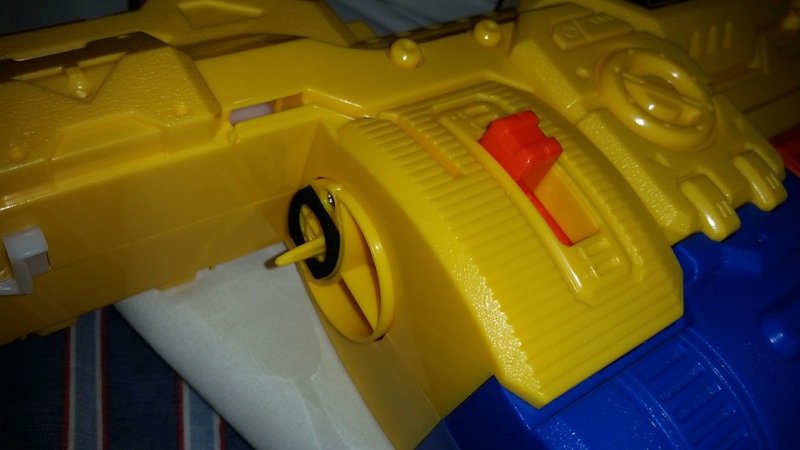 A switch on the side of the blaster switches between the two sections. Tiny plastic guards clip into the sides of the shell, above the cylinder, but are purely cosmetic. A pump grip serves to both prime the blaster and rotate the cylinder to the next barrel. There is no stock on the Turbo Advance; in terms of style, it’s meant for spraying foam in the general direction of aim. The cylinder is removable, although extra drums are not currently for sale. If that helps you reload, however, then it’s just an extra bonus. The selector switch, as it turns out, flips over the “cap” on the plunger tube, aligning the outlet with the outer or inner rings. As you can see, the “air restrictor” valve is also there, and held in by two screws. However, removing it does very little with the stock cylinder – only the very base of the barrel is tight, so extra airflow doesn’t help fire darts further. Finally, the shell is solidly built, with a great feel to all of the plastic and detailed molding on both sides. The Turbo Advance has a fairly simple mechanism. 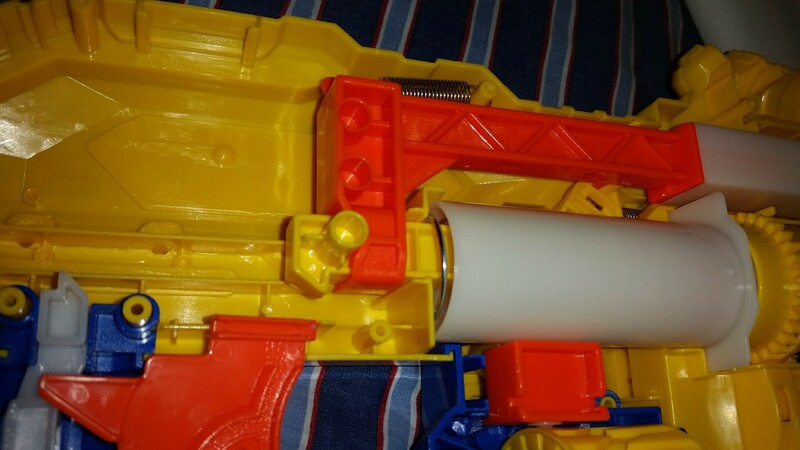 Due to the shell design, a large plastic bar extends through the top of the blaster to bring back the plunger. Several ridges on the bar also move the cylinder indexing mechanisms. There is no slamfire in this blaster. It should be noted that the rotation and plunger catch engaging do NOT happen simultaneously, making misfires possible. Simply priming the full distance each time, however, makes this a minor issue at most. The plunger draw is roughly two inches, while the plunger diameter is about 1-3/16″. It should also be noted that the plunger is offset from the center of the plunger head. This does limit your ability to nest springs around the original, due to lack of space. In any case, the entire system is solidly built, and is able to support extra spring load. In my second Turbo Advance, I replaced the spring with half a spring from an Xploderz blaster. I have lots of these, since I can find the blasters commonly at thrift stores for cheap. My first blaster averaged 77 feet per second with the included Xshot darts, and 72 fps with Nerf Elites. My second blaster averaged 75 Xshot, 71 Elites. 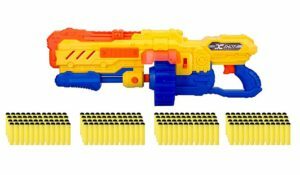 Essentially, the blaster performs on par with most modern Nerf offerings. The included darts, however, are highly inaccurate beyond short distance. When I used the blaster for a long mission at the Le Moyne Invitational, even closer shots were easy to miss with Xshot darts. Their lower weight may make for higher barrel velocities, but they’re also lacking in balance and thus accuracy. Heavier darts like Waffle and Accustrike darts fared better. As mentioned above, half an Xploderz spring will fit within the plunger tube, replacing the previous spring. Just as importantly, however, is modding the cylinder. Since only the base grips the dart, barrel replacements are needed to extract any real power. Luckily, you can remove five screws to completely disassemble the cylinder. Ideally, you need a fairly tight barrel material for a spring-powered blaster. 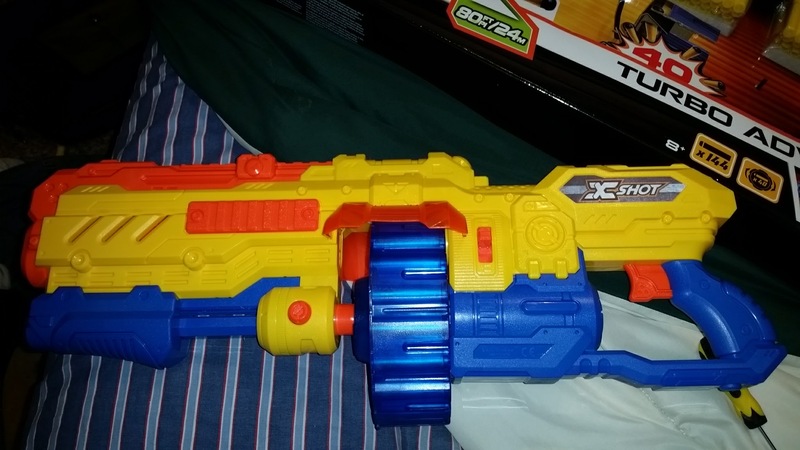 However, since this is a blaster made for loading on the fly, being able to load darts without extra time fiddling with darts that are slightly too wide is essential. 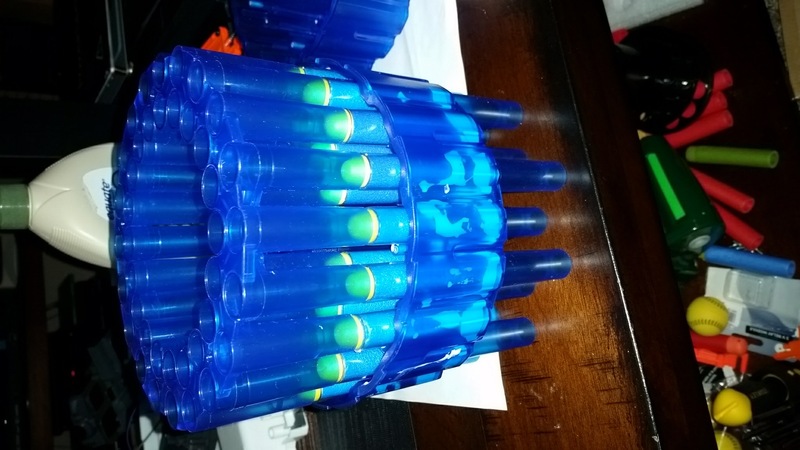 My solution lay in a small coincidence: the grooves at the base of the cylinder that mate with the barrels are a friction fit to PETG from McMaster Carr (Item #2044T43). 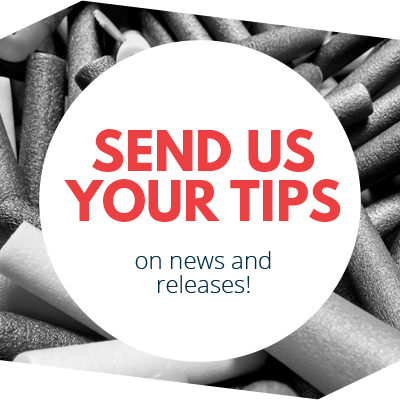 I made forty 2.5″ long barrels, then used a 3d printed PETG tightening crimp designed by Ryan from Make Test Battle on all of the barrels. In reality, this results in an effective barrel length of just 1.5″. 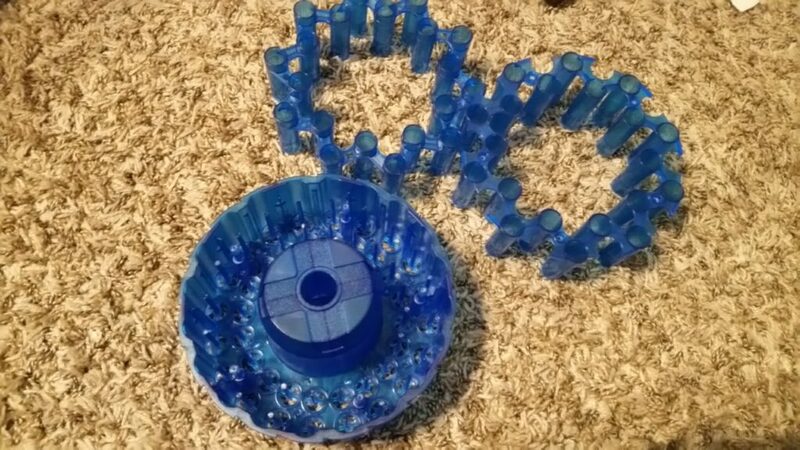 However, it also means I can easily insert darts on the run, and the dart heads will sit just past the end of the PETG lengths. I used Liquid Nails to glue the new barrels in place, loaded darts, then placed the old barrels on top as a way to keep everything aligned. With the spring and modified cylinder, I consistently hit 100fps with Accustrike darts and similar ammo. With the increased dart velocity, the forty dart capacity, and easy reloading, the Turbo Advance became a viable option for superstock wars and HvZ. It’s a different play style than using magazine-fed blasters, but the Turbo Advance still has its place. I imagine more can be done with it. The Turbo Advance has been out for most of the fall, available at a good price and with large numbers of darts (even if they’re highly inaccurate). With such a high capacity and stock performance on par with Elite blasters, it fills a similar role to the Magnum Superdrum. (Ratings below will reflect the stock blaster). With modification, however, the Turbo Advance can be even greater. 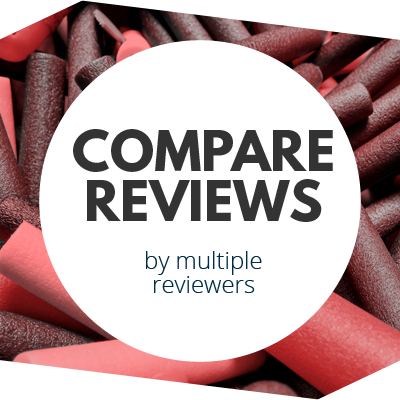 This entry was posted in Dart Blasters, Reviews and tagged 2017, advance, review, turbo, xshot, zuru on December 24, 2017 by BuffdaddyNerf. Do you have any images of it complete after the modifications. I can get them here in Aus for a reasonable price but they are gutless compared to my kids UK spec Bug attack crossbows.